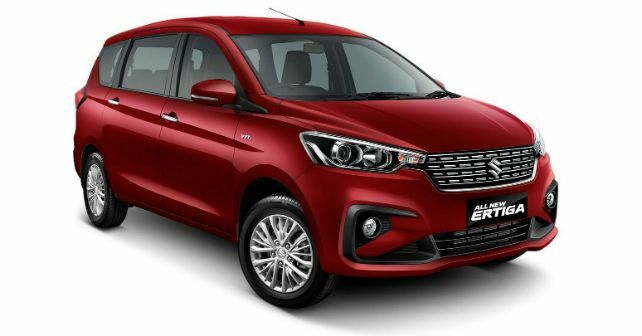 Maruti has fitted this new-gen Ertiga with the new 1.5-litre motor that debuted in the Ciaz. Just like the sedan, this one too comes with the Smart Hybrid tech. The gasoline-powered Ertiga now makes 103bhp and 138Nm – up from 90bhp and 130Nm. The diesel Ertiga continues to be powered by the same 1.3-litre motor that pumps out 88.5bhp and 200Nm. Both engines come paired with a 5-speed transmission while petrol also gets the option of a 4-speed torque converter. Now that you know what’s under the hood of the second-generation Ertiga, let’s get on with what each of the variants has. It is great to see that Maruti Suzuki has not compromised on safety features even in the base LXI / LDI trims. Both these variants come with two airbags, ABS with EBD, ISOFIX, Speed sensitive door locks and more. Other features on the base variants include projector headlamps, LED tail lamps, tilt adjustable steering, power windows and manual air conditioning. Although the base variant of the new Ertiga demands Rs 1.1 lakh more before, a look at the brochure makes the additional cost rather justifiable. In addition to all the above-mentioned features, the VXI and VDI variants get a 4 speaker audio system with Bluetooth, USB and AUX connectivity. The steering has been fitted with controls for music and your telephone. Turn indicators on the ORVMs, body coloured door handles and ORVM casing, electronically folding and adjustable wing mirrors, 15-inch wheels and more. The automatic variants also come with Electronic Stability Program and Hill hold function. The VXI and the VDI trims have all the essential features that one could possibly want and that should make it the better selling trims of the lot. Maruti Suzuki has fitted the ZXI/ZDI variants with adjustable front seat belts, height adjustable driver seat, button start, automatic climate control, rear wiper and defogger. Except for the addition of fog lamps, there aren’t many changes on the outside from the VXI/VDI trims. The top-of-the-line ZXI Plus and ZDI Plus variants only get the addition of SmartPlay infotainment system with Apple CarPlay, Android Auto and navigation. These also come fitted with a reversing camera and a leather-wrapped steering wheel.